A funeral service for Darlene “Darby” Marie McDougal of Newark, Ohio, originally from Greenwich and Granville, will be held at the McPeek- Hoekstra Funeral Home 133 S. Prospect St., Granville, Ohio on Thursday, October 25, 2018 at 10:30 A.M. with Pastor Anthony Payton as celebrant. Interment will follow at Wilson Cemetery, Newark. The family will receive friends Wednesday from 6-8 P.M. at the funeral home. 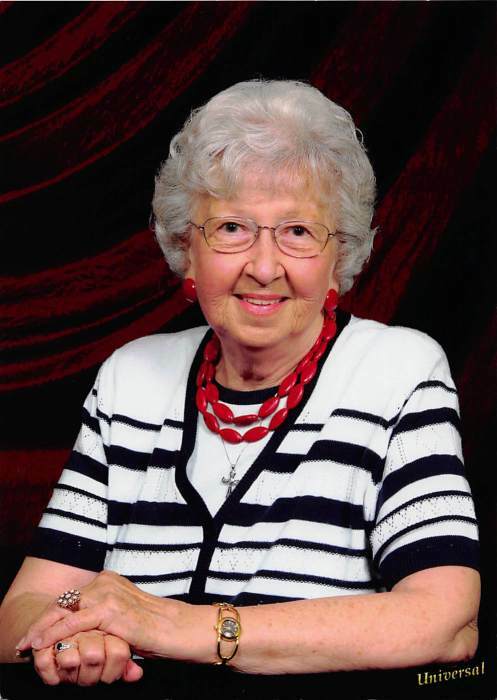 Darlene passed away October 17, 2018 at Flint Ridge Nursing Center in Newark. She was born in Boughtonville, Ohio on Feb. 28, 1935 to the late Fred and Wilma Ebinger. Darlene graduated from Greenwich High School, Greenwich, Ohio in 1953. She worked as a secretary several years before raising her family. She was a 58 year member in Ohio Eastern Star, a member of Altrusa, Heart of Ohio Quilting Guild. She loved gardening, flowers, canning, quilting and baking the best chocolate cake in the world, and especially loved watching her 4 grandchildren until they began school. Surviving are her sons Barry (Lorrie) McDougal and Alan (Colleen) McDougal; grandchildren, Scott (Roxanne) McDougal of Chicago, Katelyn (fiancé Paul Boeshart) and Molly McDougal of Newark, and Stephanie McDougal (fiancé Eric Beatty) of Weirton; great grandson, Weston Stone McDougal; and special friends Nancy Strider, Kay Hill, and Harold Burns. In addition to her parents, Darby was preceded in death by her husband of 52 years, Harold who died in 2007; brothers, Dale, Robert, Earl and Evert; and sisters, Clare Ellen, Eloise, and Carol. Memorial contributions may be made to Generation Hospice, 1435 A W. Main St, Newark, OH 43055 or Newton Township Fire Department, 1 Fire House Dr., St. Louisville, OH 43071.